Committees warn of halting transport services in rural roads, scrap discount for senior citizens and students, and not paying bank loans. 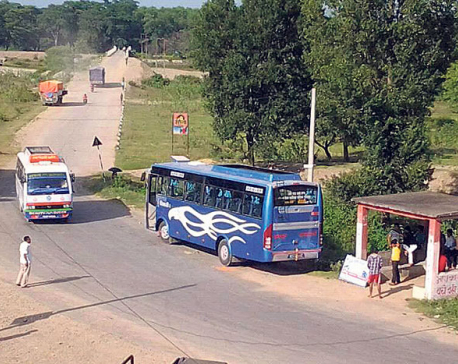 POKHARA, April 18: While the government is mulling stringent measures to uproot transport syndicates, the cartels are not ready to give up easily. They are not prepared to accept the newly introduced Transport Management Directive and other government policies intended to scrap the powers of the transport committees. In retaliation, the cartels have announced protest programs to bring the government to its knees. Various transport committees have united against the government's decision and threatened swift retaliation by warning to halt transport services in rural areas, scrapping discount for senior citizens and students, and not paying their bank loans. They have also threatened to unilaterally 'adjust the fares' if the government proceeds ahead to implement the directive. Stating that the new directive will displace them, the cartels have warned that the government's forceful implementation of the directive will only invite conflict rather solve the current problems. Gandaki-Dhaulagiri Zonal Public Transport Entrepreneurs Coordination Committee organized a press conference on Monday and issued the warning stating that they would be compelled to take the matters in their own hands if the government makes any move against them. “The government is trying to displace us by accusing us of promoting syndicate. 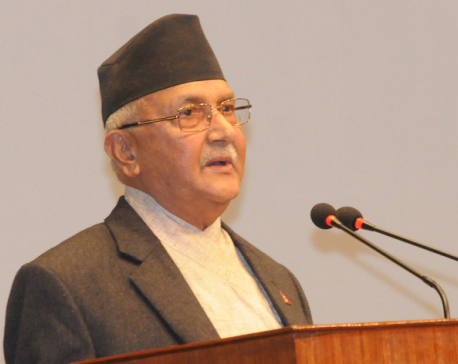 We'll respond to it with protests,” said Yogendra KC, senior vice chairman of the committee. “Protest programs will be declared within a few days. It'll be carried out in all seven provinces,” he added. According to him, the main concern of the transport entrepreneurs is the announcement of the new directive without consulting them. “Although the government claims that we are running syndicates, we actually are not. We have not created monopoly in the business. In fact, we are providing our services in rural roads despite incurring huge losses there,” KC said. In the first phase of the protest, the committee would discontinue operation of all of their vehicles. “In case we have to operate vehicles, we will operate it only in urban routes. We will discontinue giving our services in rural roads while incurring losses,” he further added. The committee also condemned the government's plan to scrap license of transport committees. According to KC, they had formed the committee to share accident costs and compensation as one entrepreneur alone will have difficulty covering the expenses. “In case of accidents, entrepreneurs affiliated to a committee collect some money to help the members. However, if the government scraps our committee, we will no longer be able to provide compensation,” he said, urging the government to introduce good insurance policies. The Federation of Nepalese National Transport Entrepreneurs (FNNTE) vice chairman Yen Kumar Sai said it is the government who is practicing syndicates, not the transport entrepreneurs. “We are only operating our vehicles on turn basis. But the government introduced the directive without our consent. We are against it,” said Sai, who is also the chairman of Prithivi Highway Bus Operator Committee. On the other hand, the Department of Transport Management (DoTM) has threatened to scrap the route permits of vehicles that refuse to operate. Earlier this month, the agitating transport entrepreneurs along the Arniko Highway were forced to withdraw their protests after the government threatened to scrap their route permit. Likewise, the DoTM had also issued temporary permits to vehicles to operate along the affected route when the Arniko cartel refused to operate their vehicles. FNNTE Senior Vice Chairman Bijay Bahadur Swar informed that they will make their protest plans public on Wednesday. “All five transport entrepreneur federations will jointly make public our demands and the protest plans. We will continue our protest until the government meets our demand,” he said.